Around 34 to 23 million years ago, this part of Oman was much lower than it is today and covered by a shallow sea. 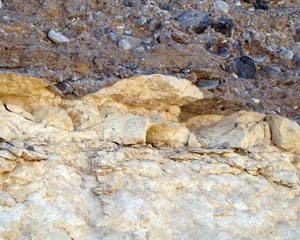 The Mid Tertiary limestone originally formed in horizontal layers on the sea floor. Over time the rock layers became slightly titled. If you take a closer look you can see this by following the grey lines in the limestone. The land was later uplifted. Then, in the last 2 million years, a large wadi deposited layers of gravels of various sizes and of different origins, burying the marine formation. These gravels became cemented together to form a rock called conglomerate. Here, as there is a gap in time between the deposition of the limestone and conglomerate, the meeting of the two layers of rock is called an unconformity.